Flagstick has numerous marketing options available to those looking at targeting the golf industry at the regional level. Each publication we produce is distributed free of charge to over 300 golf courses throughout Eastern and Central Ontario and your advertising message can be delivered through any of our publications. 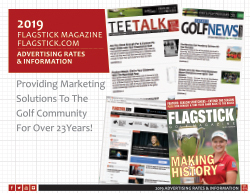 When you advertise in a print version of Flagstick you are also being given the reach of Flagstick Online with each PDF file downloaded of that issue. Flagstick Golf Magazine is celebrating 24 years of publishing and we continue to grow stronger as a voice in the golf world. Over two decades of publishing we have continued to evolve in how we deliver our editorial to readers and support the messages of our marketing partners. We are consistently recognized within the industry for our adoption of leading edge technology even before the mass of the market arrives to join us. Our progressive and extensive use of social media networks continues to drive our readership levels and as a result, provide significant benefits to our advertisers. That is also enhanced by making our print publications readily available on a digital platform. At the same time our following for our print editions continues to thrive. The depth of our local content and frequency of our issues makes us a trusted resource for all golfers. We are an integral part of the community golf conversation and that makes our partners part of the story as well. Even as we evolve the way in which our content is delivered to our readers, we have continued to ensure we produce the best possible printed publication as much of our readership still enjoys their golf content delivered in the traditional print fashion. Flagstick has been devoted to providing a marketing medium that reaches the golf market in this region better than anyone else, with an affordable mix of opportunities for every advertiser, with any budget. We are not a one dimensional business and because of that we know that marketing with us will work with the right kind of commitment, regardless of your budget. FLAGSTICK.COM is fast becoming one of the primary sources for golfers in Canada to get all their golf information needs whether it be equipment, travel, instruction or news. Building on the things we have learned about what golfers are looking for in a website, we continue to develop an online source that encompasses the elements of information and communication that should satisfy every golfers needs. From golf course information to equipment reviews, from what’s happening to what’s going to happen…we have it covered. One of the things the FLAGSTICK.COM is most proud of is our connection to our golf community. For over 23 years we have spent countless hours connecting with golfers at tournaments, events, social media and of course, our website. We pride ourselves on being leaders in the delivery of content to the thousands of golfers who spend time with us online. Our content is homegrown, no news feeds…everything we publish comes from our writers and correspondents and is uniquely prepared for FLAGSTICK.COM. We hear it regularly from readers, the industry, and fellow media members – no Canadian golf media outlet is more engaged with golfers. Through all our channels we engage and listen to our audience, take their questions, and offer expert insight and advice. That includes sharing insights about our marketing partners, helping push their businesses to greater success. Today’s advertiser is always in search of new, complementary options to deliver their marketing message. The digital marketing era hasn’t just arrived, it has begun to take over how we reach customers. But, it is not enough just to simply throw graphic ads into an ad blast and fire it out to a database in hopes that the message is read or received by its intended target audience. You need to be sure that the customer has a reason to read the email being sent and that your marketing message has an opportunity to get noticed and acted upon. Flagstick’s TEETALK e-newsletter has been re-built with exactly that in mind…a content-based marketing tool that encompasses internally generated editorial content that is extremely informative, timely and relevant to the audience including a subtle, non-intrusive ad space that is large enough to include your entire message but small enough to not overpower the content. The secret to this type of digital marketing strategy potentially being more successful is its delivery method. Rather than the traditional e-blast which goes to a specific sized database. TEETALK uses all the digital marketing options that FLAGSTICK.COM has available to ensure that the message is delivered to the largest audience possible over multiple digital platforms including Twitter, Facebook, Instagram, YouTube, Flagstick.com & Flagstick Forum. 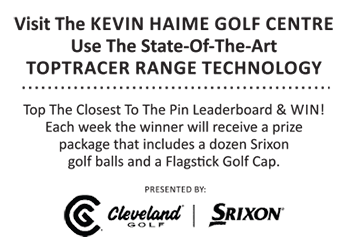 Of course anyone can send the link to an e-blast through social media and post it to a website, however, very few have the social media presence or website traffic that Flagstick.com has…period! After three successful seasons of publishing Ontario Golf News as a digital publication has evolved to better meet the demands of both readers and marketing partners with a more frequent publishing model. The members of the Golf Ontario and golfers throughout the province are asking for more information in a format they can consume on a more timely basis. We wanted to be able to deliver that in a format that was also more mobile friendly, reflecting modern trends. Welcome to OntarioGolfNews Digest. This new twice-weekly newsletter is distributed directly to the inboxes of the 25,000 plus people and growing on the Golf Ontario’s database. Golf Ontario is the largest regional Golf Association in Canada and services over 100,000 golfers every year. Using one or more edition of OntarioGolfNews Digest is a valuable investment in your businesses marketing . Our partnership with Golf Ontario allows us to deliver a quality content marketing program to one of the most pure golf databases in Canada.It’s content will be similar to that of the digital edition but will be fed from the vast amount of golf content created by the FLAGSTICK.COM website, making the information delivery current and extremely relevant. Golf Ontario believes so strongly in this partnership that OntarioGolfNews Digest is also their main direct to inbox communication tool, replacing their own e-newsletter. Flagstick Golf Magazine and its affiliates may be a thriving business but in the last 23 years it has proven to be far more than that. We are heavily involved in the golf community beyond simply providing news coverage of the events within our region and beyond. We strive to support not only the golf community, but our region as a whole through a variety of sponsorships and events we promote, embrace, sponsor, and help to develop each and every year. The community has been kind to us so we try and give back to those who get behind our efforts and enjoy our content. This includes, but is not limited to, thousands of magazines and dozens of prizes that are given by us each year to support worthy charitable tournaments. It also includes heavy involvement in a wide variety of events.